What on earth did the Banga brothers' mother feed them for breakfast? Whatever it was, it worked: Vindi Banga grew up to become a top executive at the food and personal-care giant Unilever, then a partner at the private-equity firm Clayton, Dubilier & Rice. His younger brother Ajay, after heading Citigroup's Asian operations, was last year named CEO of MasterCard  all without a degree from a Western business school and without abandoning his Sikh turban. When Ajay took over at the credit-card company's suburban  New York City headquarters, the Times of India crowed that he was the first "entirely India-minted executive" at a multinational's helm. The brothers laugh when asked for their mother's breakfast menu, deflecting suggestions that they were raised by a Bengal-tiger mom. Instead, they cite an itinerant childhood as a key ingredient in their success. The sons of a lieutenant general in the Indian army, they moved to a new posting every couple of years  perfect training, it turns out, for global executives facing new markets and uncertain conditions. "You had to adapt to new friends, new places," recalls Vindi. "You had to create your ecosystem wherever you went." The Banga brothers are two of a growing roster of global Indian business leaders, a roster that includes CEOs such as Citigroup's Vikram Pandit and PepsiCo's Indra Nooyi as well as the deans of both Harvard Business School and INSEAD. Yes, ArcelorMittal's Lakshmi Mittal had the advantage of growing up in the family business, but now the family business has grown into a global powerhouse under his leadership. What factors account for the rise and rise of India-trained business minds? "Our colleagues in our Asian offices are asking the same question," laughs Jill Ader, head of CEO succession at the executive-search firm Egon Zehnder International. "Their clients in China and Southeast Asia are saying, 'How come it's the Indians getting all the top jobs?'" It could be because today's generation of Indian managers grew up in a country that provided them with the experience so critical for today's global boss. Multiculturalism? Check. Complex competitive environment? Check. Resource-constrained developing economy? You got that right. And they grew up speaking English, the global business language. It's risky to generalize about India, a subcontinent of 1.2 billion people, just as it's simplistic to stereotype the Western executive or the Chinese business leader. Motorola's Sanjay Jha or Berkshire Hathaway's Ajit Jain, one of those tipped as Warren Buffett's successor, succeed due to talent and drive, not because they're Indian. And bosses like Nooyi spend most of their formative career years outside the country. Is it that they may just happen to be Indian? 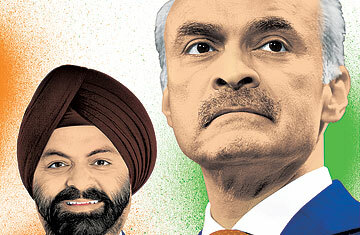 As Ajay Banga notes, "You are who you are because of what you do, not the color of your skin." The data suggest Indians are scaling corporate heights. In a study of S&P 500 companies, Egon Zehnder found more Indian CEOs than any other nationality except American. Indians lead seven companies; Canadians, four. Among the C-suite executives in the 2009 FORTUNE 500 were two mainland Chinese, two North American Chinese and 13 Indians, according to a study by two professors from Wharton and China Europe International Business School. For multinationals, it makes good sense to have leaders experienced in working with expanding Asian markets. And India is already the location of many of their operations. "If you look at companies like Pepsi or Hewlett-Packard or IBM, a huge chunk of their global workforce is sitting out in India," says Anshuman Das, a co-founder of CareerNet, a Bangalore executive-search company. "India and China are also the countries of future profits for the multinationals, so they may want their global leaders to come out of them." Competitive and complex, India has evolved from a poorly run, centrally controlled economy into the perfect petri dish in which to grow a 21st century CEO. "The Indians are the friendly and familiar faces of Asia," says Ader. "They think in English, they're used to multinationals in their country, they're very adaptive, and they're supremely confident." The subcontinent has been global for centuries, having endured, and absorbed, waves of foreign colonizers, from the Mughals to the British. Practiced traders and migrants, Indians have impressive transnational networks. "The earth is full of Indians," wrote Salman Rushdie. "We get everywhere." Unlike, say, a Swede or a German, an Indian executive is raised in a multiethnic, multifaith, multilingual society, one nearly as diverse as the modern global marketplace. Unlike Americans, they're well versed in negotiating India's byzantine bureaucracy, a key skill to have in emerging markets. And unlike the Chinese, they can handle the messiness of a litigious democracy. "In China, you want something done, you talk to a bureaucrat and a politician  it gets done," observes Ajay. "In India, if you talk to a bureaucrat or a politician, there are going to be 600 other people with their own points of view." There's an old saw about Asian business cultures: "The Chinese roll out the red carpet; Indians roll out the red tape." Maybe that's why Indian managers are good at managing it. They have cut their teeth in a country ranked 134th by the World Bank for ease of doing business. To be fair, it's also the reason some of them left home. They're practiced in the exasperating culture of local, state and national permits. "To build a factory in China, a CEO will have to get two or three different permissions from various departments," observes Signe Spencer, a co-author of The Indian CEO, a 2007 study from the HayGroup consultancy. "An Indian CEO may have to get 80 different permissions from 80 different places." No wonder Indian executives spend much of their time networking and lobbying  tasks Western CEOs leave to their corporate public-affairs departments. India's economic liberalization, which began in 1991, was another blessing for this generation of executives. It gave them exposure to a young and fast-growing consumer market. "Liberalization unleashed a level of competition that makes you stand on your toes," recalls Vindi. "We had to learn to compete with international players but also with very good, extremely fast local ones." In 1987, when Vindi was CEO of Hindustan Unilever, the company's leading detergent, Surf, faced off against Nirma, a locally produced brand. "It didn't cost 5% less, or 10% less," says Vindi, shaking his head. "It cost a third of our product. We had to make a product that was better, for the same price." Within 12 months, they had. See TIME's special report "India's 60 Years of Independence." See "Wen Goes to India: Can Asia's Powers Make Peace?"